If you haven’t realized, my birthdays are a big deal to me. I took a huge amount of time when I launched the blog back in 2010 to recap previous birthdays, and last year, I recapped the festivities pretty well. It was a month late, but nevertheless, it was important enough for me to talk about it. 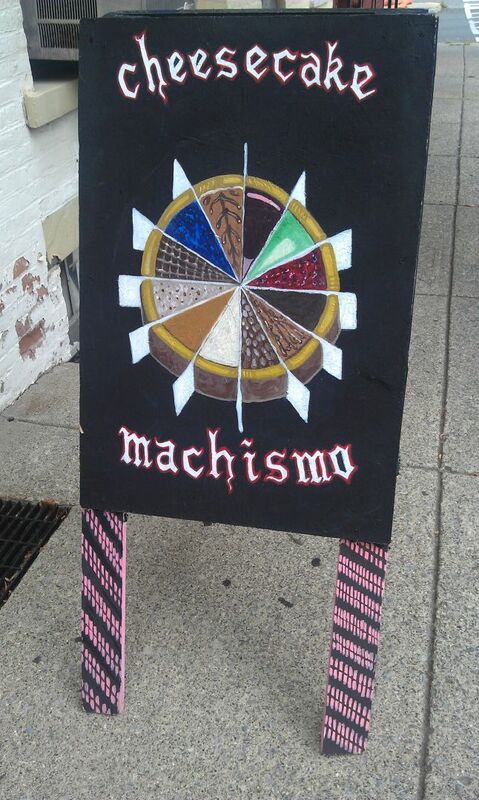 This year, I’ll probably recap everything pretty well soon, and I’ve already announced the giveaway pertaining to my birthday, but also I’ve been working with Lynn, co-proprietor of Cheesecake Machismo (see also derryX dines: Cheesecake Machismo), to bring something extra special to my birthday this year. I contacted Lynn, months ago, about special ordering a cake for my birthday. Sitting at my kitchen table eating 12 slices of a Cheesecake Machismo cheesecake was the only thing I wanted for my birthday. Early in the planning, Lynn asked me what I wanted, and I was really confused of where I wanted to go with it. First and foremost, I wanted something that was visually stunning, so I looked to the place I go when I need inspiration. It was a birthday cake, so there should be a component of baked cake, non cheesecake, in it. There are a number of examples offered there that have red velvet or another cake base. 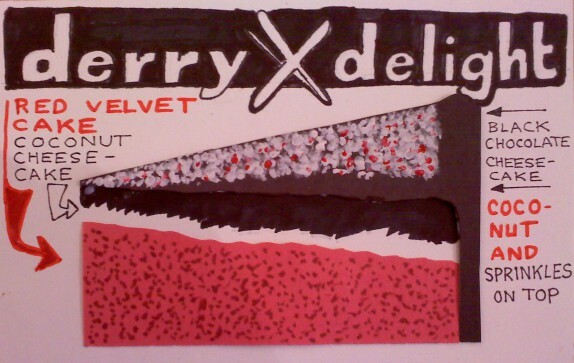 Red velvet was my decision because it could be a nice and deep red. I love coconut, and coconut cheesecake at Cheesecake Machismo is really white. Chocolate and coconut is brilliant (Mounds/Almond Joy, anyone? ), and the chocolate cheesecake there is very dark. The topping had to reincorporate the colors, so I wanted some fresh coconut on top. Lynn suggested red sprinkles. Ganache was added to bind the toppings to the cake as well as provide the black base for the top. 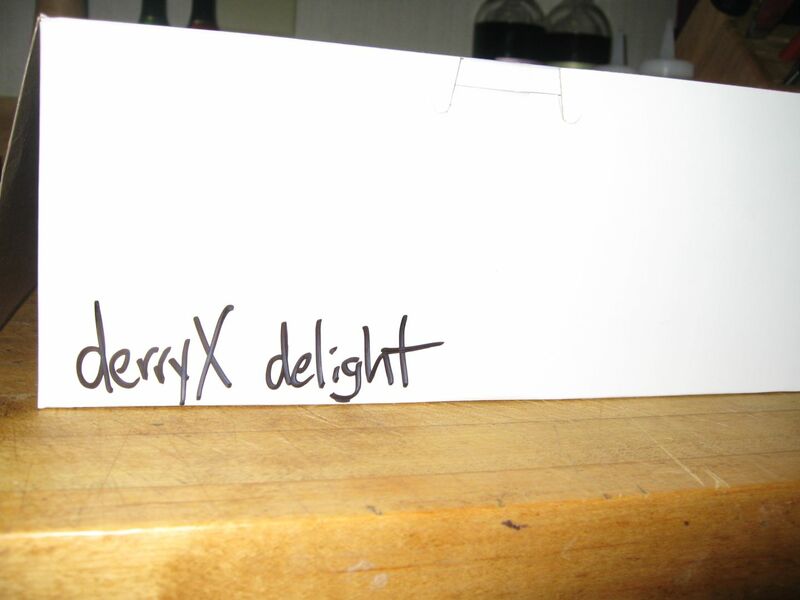 So, that’s the derryX delight. Kevin, the young man you probably know if you regularly visit, was kind enough to draw a custom diagram of the cake at my request . 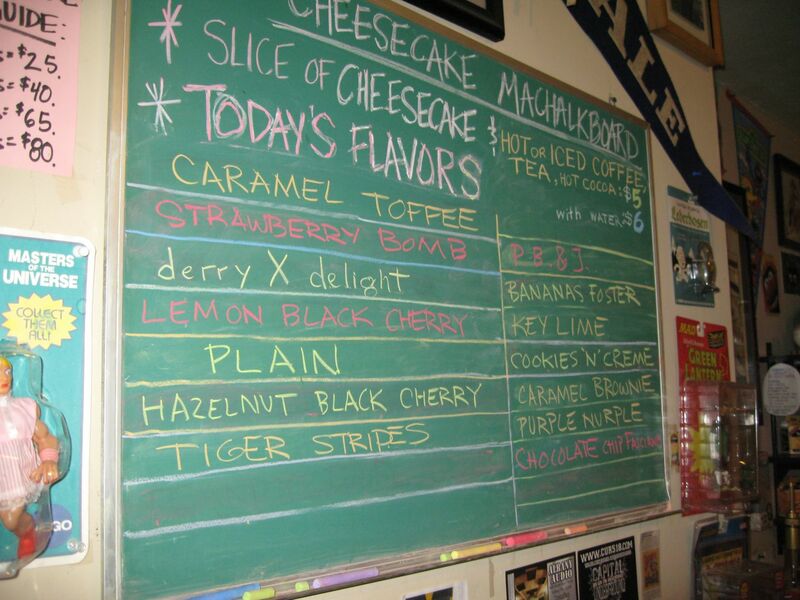 And, thus, derryX delight has become immortalized in Cheesecake Machismo canon. When I met with Lynn to pay for my cake, she was excited that, because of the way she has to make the cake, she would have a cake to offer for sale in the shop. I picked up my cake last night, July 26. 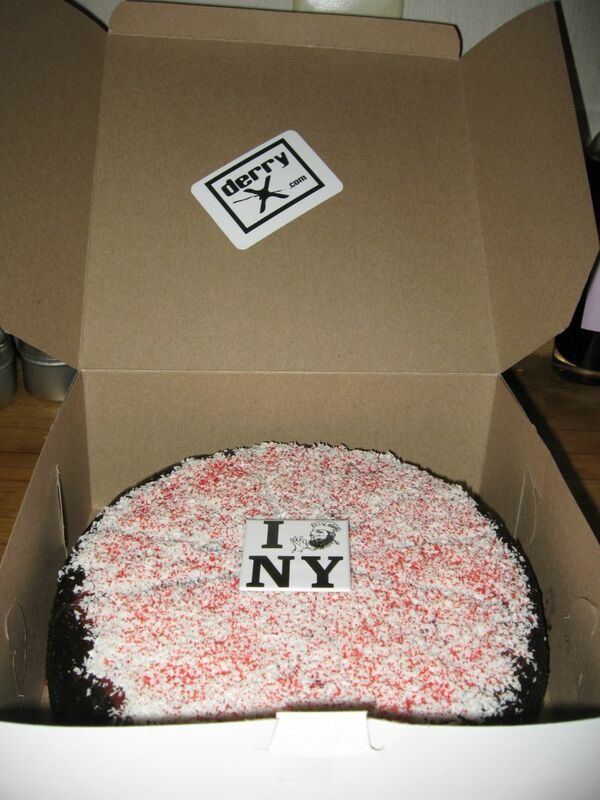 In addition, derryX delight was one of the cakes offered in the shop. Lynn was there, and I took the opportunity to take a picture of her with the cake she literally spent the entire previous evening crafting to meet my crazy criteria. 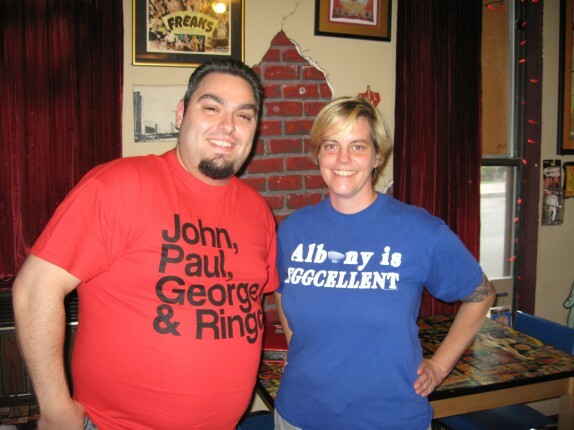 We also posed for a picture together and asked an unsuspecting customer to capture this meeting of the minds. While we were posing for pictures, I’m not sure if it was the customer who snapped the picture of us or the person he was with, but that person bought the demo slice of derryX delight that Lynn posed with. In fact, from the time it was announced on facebook (sometime around 2PM), and 5:30pm, a good portion of the cake was gone! 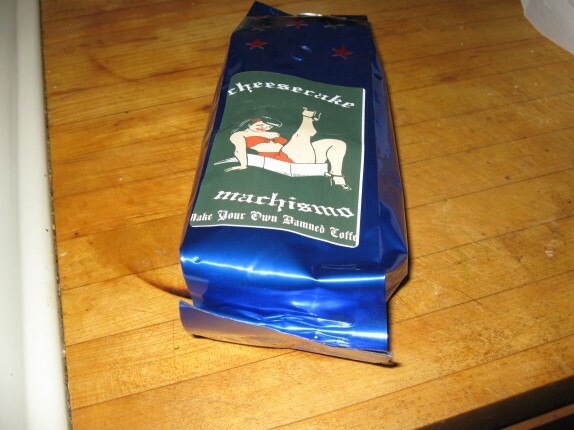 The line was also starting to build while I was in the shop, so I took the bag of freshly roasted whole coffee beans that Lynn gifted to me for my birthday and my cake and tried to sneak out. When I got home, I took the opportunity to snap a few pictures of my cake. derryX delight in all of its glory! It is rich and decadent, as you probably figured. 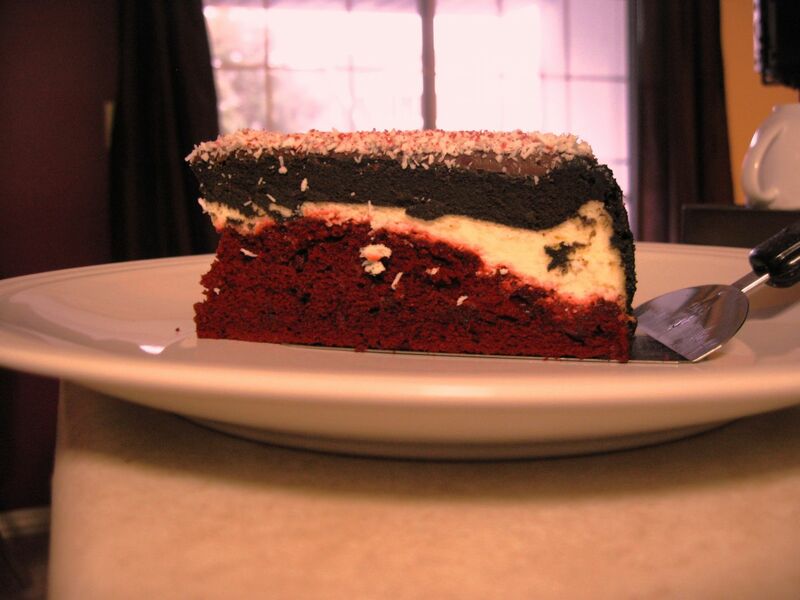 The layer of red velvet cake breaks up the richness a little and adds some texture. The chopped coconut and sprinkles on top adds crunch and really drive the thing home. I think it would really be an annoying thing for me to explain how great the cake was if you didn’t have an opportunity to have some. As of right now, there are seven slices left in the shop, and you can get one of the seven slices along with a coffee by walking into Cheesecake Machismo (293 Hamilton Street in Albany, NY) and paying $5 to the nice man at the counter, just like anything other slice there [The $5 charge for a slice of this cake, just like any other, goes toward keeping Cheesecake Machismo running, not to me, not a cent.]. I’ve been told that five slices went in the span of 6 hours, prior to this announcement, so hurry in! And, if it’s super popular, who knows? Maybe, Lynn will decide to make it again for the shop with or without some pressure from the internet. (If I had to guess, this flavor will come up again, so watch their facebook updates closely.). All I know is that I have a box containing (now) under 10 slices, and you can’t have any of those! Coconut in cheesecake sounds so FN good. I.Am.So.Jealous! But you are very deserving of this treat! 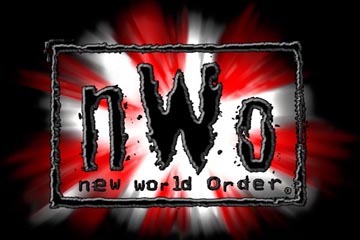 I just love that crew, and happy Birthday… to you. Wow. I rhymed! This is totally cool. Happy Birthday! And… “[if you’re going to argue with me over whether black and white are colors, I’d like you to please stop reading and jump in a lake]”… made me laugh out loud. Thanks, Sue! I had to take the preemptive on that one because people like to argue with me about the dumbest things. you had me until I saw coconut. This sounds awesome. That’s my favorite color combo, too, and we had red velvet for our wedding cake. Adding cheesecake and coconut is genius! I’m with Sue about the “go jump in a lake” comment. That cracked me up. Happy Birthday!! GENIUS!! That looks so good and I love that you had them make your own special cheesecake. Will they be serving that in the future I hope? I believe it’s going into the rotation. Keep an eye on their Facebook to catch it when available!